Many parts of the Northeast have been developed more than other regions of the country, which makes rugged wilderness areas even more special. Blanketed in thick hardwoods, dotted with blue water and stone summits, and home to plenty of animal life, the lakes and mountains region of Maine is one of those special areas. And this region isn’t just a wilderness relative to the Northeast—it stacks up against any wild lands, anywhere. So if you’re wondering where to even start on your next trip to the Pine Tree State, you’re in luck—we put together this list of the 10 best outdoor adventures in the area. The Bigelow Mountains and their namesake preserve are worthy of much more exploration than a single day hike, but for those hoping to get a taste of their sweeping views and thick forests, the Fire Warden’s Trail to Avery and West Peaks is a great introduction to the area. Climb 4.6 miles over small bridges and water bodies to the ridge between the two peaks for views of Sugarloaf and the rest of the Bigelows. From there, it’s less than half a mile to either of the craggy summits, linked by the Appalachian Trail, and expansive views down onto Flagstaff Lake. 2. Paddle a portion of the North Forest Canoe Trail. The entire NFCT stretches 740 miles from New York to Maine, so traveling the whole thing might be more than most people want to take on. Most paddlers will have an easier time on the section from Lower Richardson Lake to Rangeley. Put in at Middle Dam and spend one or two nights making your way northeast along wooded shorelines to camp on Mooselookmeguntic Lake before carrying into Rangeley Lake and finishing up at the boat ramp in town. 3. Ski some of the best snow in the East. Enjoy the views from the largest ski area east of the Rockies. 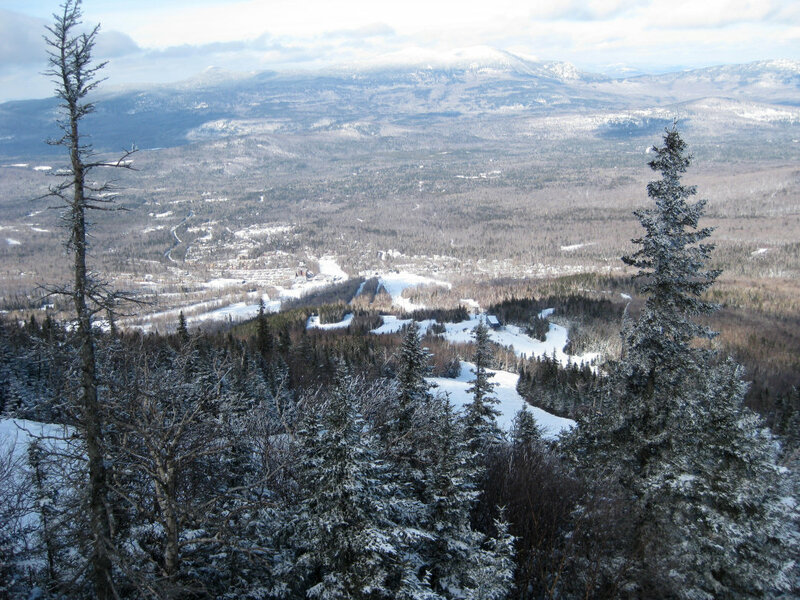 With close to 1,000 skiable acres, Sugarloaf is the largest ski area east of the Rockies. When you combine The Loaf with the region’s other mountains—Sunday River, Mount Abram, Black Mountain, Titcomb Mountain, and Shawnee Peak—there is phenomenal skiing for everyone, from beginner bunny slopes to expert, steep backcountry. Maine regularly has some of the deepest and nicest snow in the region, perfect for a family of powder hounds. Many of the mountains are year-round destinations that feature zip lines, scenic lift rides, mountain biking, and hiking in the summer. 4. Cool down in a swimming hole or waterfall. Where there are lakes, there are waterfalls and swimming holes to take the edge off the summer heat. Hike about a quarter mile from North Oxford to The Cataracts, a 100-foot high series of waterfalls funneling into a mossy green pool. Check it out during the spring when the faucet is turned all the way up, for an impressive sight. For a calmer swimming hole, Frenchman’s Hole near Bethel features crystal clear water and high rocky ledges to jump off of. 5. Hike the Appalachian Trail to Old Speck Mountain. Northbounders on the AT will wrap up their journey in Maine’s Baxter State Park, but they’ll begin the final stage of their trek in the Mahoosuc Range on Old Speck Mountain. Take the white blazes of the AT 3.5 miles along meandering Cascade Brook. From there, a short 0.3-mile spur trail will pop hikers out on the forested summit. Climb the summit fire tower for the full 360-degree view, including 1,000 feet below to Speck Pond. 6. Spot a Moose in Franklin County. Look for the mighty moose between Eustis and Chain of Ponds. 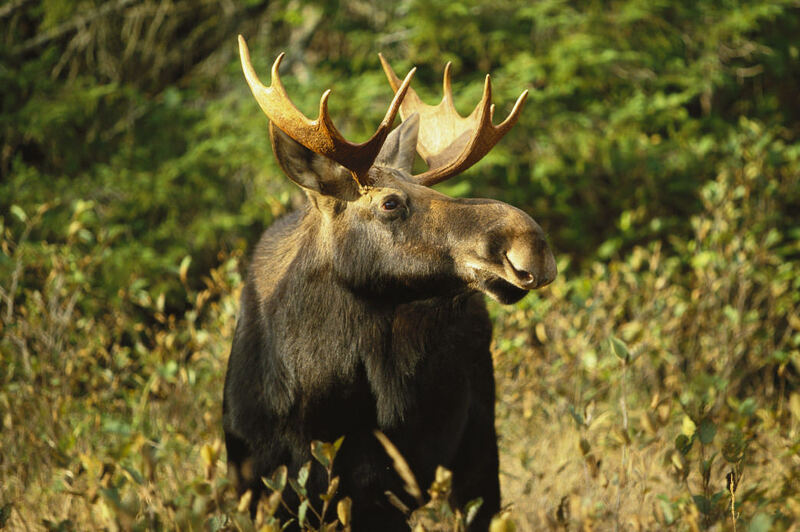 Keep your eyes peeled while driving on Route 27 for the chance to spot a majestic moose. Ask the locals for the best spots for sightings between Eustis and Chain of Ponds or take a hike around Sugarloaf to have a good chance of seeing one of the megafaunas. 7. Ride through Sunday River’s Mountain Bike Park. Wind through a network of 20 miles of narrow, technical, gondola-served trails, the mountain biking at Sunday River is not for the faint of heart. Technical terrain is plentiful for intermediate to advanced riders, but novices are welcome to hone their skills with the on-site mountain bike school. Numerous jumps, banking berms, and bridges get you down the mountain quickly, or mellower trails wind through the resort’s numerous peaks, giving you fresh terrain and scenery all day long. 8. 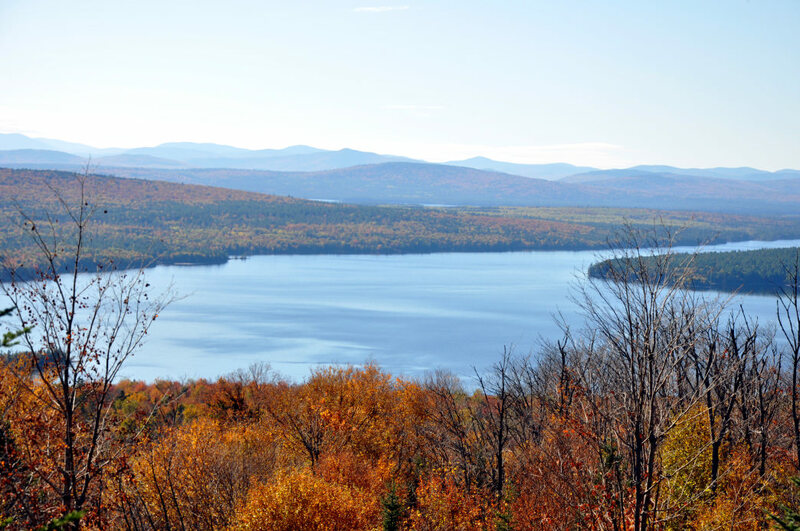 Drive the Rangeley Lakes National Scenic Byway. Take a relaxing drive and look out over miles of lakes, mountains, and seemingly untouched forests. Sometimes sitting in a car can be just as nice a day as spending the same amount of time hiking or biking—and you’ll see a lot more of the state at 50 miles per hour. One of the best options is the Rangeley Lakes National Scenic Byway, taking you 36 miles through the Rangeley area along Routes 17 and 4. From the “Height of Land” viewpoint on the route, look west over miles of lakes, mountains and seemingly untouched forests. On a clear day, you can see into New Hampshire and Canada. 9. Take a winter hut trip. Mountain hut trips aren’t just for the bigger peaks of Colorado and Montana. Maine has an 80-mile trail network designed for Nordic skiers and snowshoers that links four isolated, off-the-grid huts in Kingfield. Breaking up cold days of skiing with warm, cozy shelters, hot showers, toilets and comfortable beds certainly makes roughing it in the winter a little easier. 10. Rock climb at the Shagg Crag. This may be a list of the best things to do, but it’s hardly all that Maine’s Lakes and Mountains region has to offer. Check out our vacation planner for even more ideas.